Serotonin, or 5-hydroxytryptamine (5-HT) is a monoamine neurotransmitter. It regulates a number of functions within the body, but my largest interest in it is how approximately 10% of serotonin in the body is synthesized in serotonergic neurons of the central nervous system, where it regulates mood, appetite and sleep, as well as affecting cognitive functions of memory & learning. 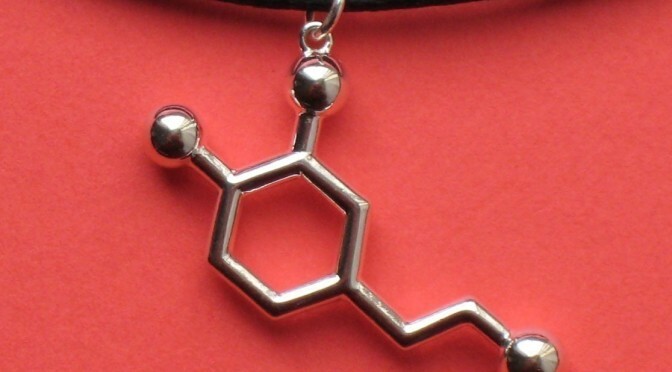 Popularly, serotonin is thought to contribute to feelings of happiness. A dear friend of mine (of nearly 20 years) has the above image tattooed on her forearm. She and many other friends of mine have struggled with depression. I’m immensely thankful in my life that I have always seemed to have enough serotonin, even in the days when I would experiment with various chemicals which would cause my body to release more (and can be problematic for those who do not produce enough). I spend a lot of time around people who are taking substances which affect their serotonin receptors. As my dear friend went to a tattoo shop here in Las Vegas to get a new tattoo following a tremendous heartbreak (in October of this year), I began speaking with the other artist in the shop that day, and within a few hours had decided to get my own serotonin molecule, for a variety of the reasons I’ve mentioned above. In December I was in Los Angeles, and Judd Weiss and I did a photo shoot, which included a number of shots of my ink. Tattoo #5. Done by Brett at Redemption Tattoo in Las Vegas, Nevada. Eventually each tattoo I have will be explained and pictured on this blog. Today was the day for serotonin.